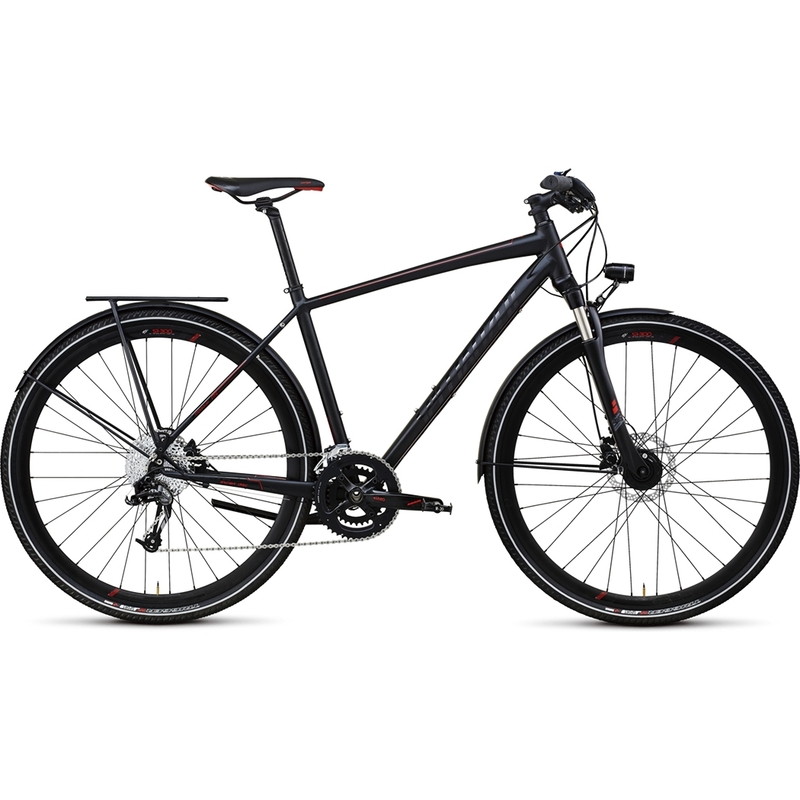 Crossover Expert Disc is a do-it-all Sportive bike with trail-ready suspension fork and 700c wheels, plus hydraulic disc brakes and integrated lighting and rack system for ultimate utility. >Smooth-welded, M4 Premium Aluminum frame plus 50mm-travel fork with remote lockout operated from the bar for lightweight confidence on any surface; fender/rack braze-ons for versatility. >SRAM hollow forged 2x10 crankset with 48/32 rings plus SRAM X9 10-speed rear derailleur for the latest in lightweight, wide-range gearing and spot-on shifting every time. >Shimano dual-piston, hydraulic disc brakes and levers assure solid, worry-free braking performance under any conditions. >Supernova E3 Pro headlight provides over 300 lumens of light, plus a minimal but super-bright taillight will help keep you safe on the road anytime. Both are powered with a on/off switchable Supernova Infinity 8 hub dynamo. >Super light and compact Racktime Ultra hollow alloy rack lets you carry supplies without adding a lot of bulk; max load 10kg. SM MD LG XL XXL. 60mm 60mm 60mm 60mm 60mm. 445mm 445mm 445mm 445mm 445mm. 170mm 170mm 175mm 175mm 175mm. 38mm 38mm 38mm 38mm 38mm. 625mm 635mm 651mm 666mm 677mm. 660mm 660mm 660mm 660mm 660mm. 70.5° 70.5° 70.5° 70.5° 70.5°. 90mm 105mm 120mm 135mm 155mm. 73° 73° 73° 73° 73°. 394mm 445mm 483mm 533mm 584mm. 737mm 772mm 800mm 833mm 868mm. 70mm 80mm 80mm 80mm 90mm. 575mm 585mm 600mm 615mm 625mm. 88mm 88mm 88mm 88mm 88mm. 1063mm 1073mm 1089mm 1105mm 1116mm.